...I bought Mr. Jenny some chocolate covered Jelly Bellies. Mr. Jenny was not quite as enamored of the whole idea of jelly belly destruction. He ate a few and kept saying, "No, these aren't Jelly Bellies...they've messed them up. These aren't really Jelly Bellies." I sucked the chocolate off a few and offered the Jelly Belly insides to him. I put myself out there by sucking off the chocolate and he declined my sacrifice. Some people DO NOT appreciate a good Halloween treat when they get it. So I had to eat the rest of them all by myself. how very kind of you to make such an offer, makes perfect sense to me....what's with him??? I have to admit, I LOVE jelly Beans and I LOVE chocolate but I am not enamored with the though of the two of them together either. Guess I am just to plain for that! I also would have had to reject your sucked on beans - but it's the thought that counts right??? The things you do for him:) I would perhaps rather just have the chocolate though! Enjoy your weekend dear friend, thanks for my surprise in the mail! HUGS! I love them plain. I agree with Mr. Matlock. Why mess with perfection! I'm amazed by all that you do for family and friends! 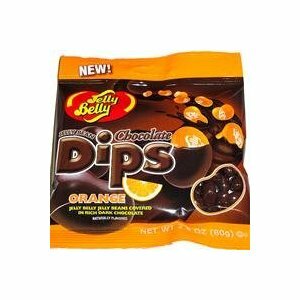 I'm also thinking the chocolate covered orange Jelly Bellies might be good! You are too funny... from having your own jelly belly to having your own jelly bellies... I don't know why he wouldn't want to eat them. It's a partnership you have right??? That's true partnership in action! Hope they were good, I've been wanting to give them a try. Oh I just can't imagine why he wouldn't try it! Ha! Ha!...at least you found a really awesome home for them!!!!! Jenny you are such a thoughtful wife! What a lucky man Mr. Jenny is for having a wife that will take it upon herself to do good for husbandkind. I haven't heard of these, however I know all about my kind efforts being rejected. LOL! Thank you for stopping over and visiting with me. This is just too funny. Didn't know they made chocolate covered ones! Have a nice weekend. The sacrifices you make! Happy Halloween! Hmmm. I guess my hubby likes jelly bellies, too. Oh you poor thing...you had to eat them all by yourself??? That must have been awful. We had one of the slowest Halloweens on record. Less than 20 kids came to the door. I bought a lot of candy, but I bought what we like just in case. It will take a while, but eventually it will all be gone.